Molnlycke Mepore Pro Dressing 3.6" X 4" 40/bx 670990 is a self-adherent, absorbent and breathable dressing with an outer film layer which protects the wound from water and contamination. Molnlycke Mepore Pro Dressing 3.6" X 4" 40/bx 670990 is a self-adherent, absorbent and breathable dressing with an outer film layer which protects the wound from water and contamination. 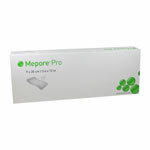 Comfortable and easy to work with, Mepore Pro offers gentle yet secure protection while minimizing inconvenience to patients.